Despite Srebrenica's Horror, A Grass-Roots Optimism Sprouts In Bosnia : Parallels Twenty years after the massacre in Srebrenica, many families are still burying their dead. But some in Bosnia are building ties across ethnic divides, says a Catholic Relief Services representative. 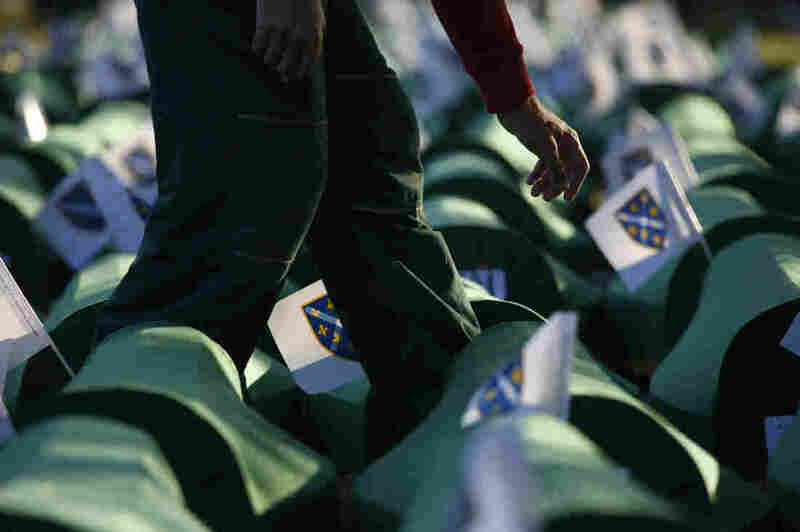 A Bosnian worker passes among coffins decorated with Bosnian wartime flags during a funeral ceremony near Srebrenica. Twenty years ago this weekend, Serbian forces rounded up 8,000 Bosnian men and boys from the town of Srebrenica. They bound their hands, marched them to fields and shot them. Bulldozers pushed the bodies into mass graves. The massacre — the worst atrocity on European soil since World War II — was a turning point. Before, the U.S. and much of Europe had stayed out of the Bosnian war; after, NATO planes were sent to bomb Serbian positions. Eventually, the Serbs came to the negotiating table in Dayton, Ohio, and the war came to an end. Today, Bosnia remains one of the poorest countries in Europe. Ethnic populations are divided and thousands of Bosnians are still displaced from the war, living in temporary shelters. And 20 years later, many are still burying their dead. More than 1,000 people are still officially missing, says Marc D'Silva, Catholic Relief Services country representative for Bosnia-Herzegovina. "They never found their remains," says D'Silva, who joined NPR's Lynn Neary from Sarajevo. "Every single year, more and more remains are found. This weekend, there's going to be another 100-some remains that are going to be buried for the first time." D'Silva's group has been working to resettle refugees. When he arrived in Bosnia a few years ago, he says there was much pessimism about the country's future. "There still is — because the Dayton Peace Accord, which was very successful at ending the war 20 years ago ... also institutionalized ethnic divisions that last to today," he says. For example, there was a tripartite presidency established ... with one member being Serb Orthodox, one being a Croat Catholic and one being a Bosniak Muslim. These three individuals are a rotating presidency. So it's very difficult to get legislation or national initiatives passed with all three of these presidents and their parties agreeing. It's very much in the interest of nationalist political parties to keep this type of frozen stalemate continuing for their kids. One of the aspects of the Dayton Peace Accord allowed each of the three main ethnic groups to determine its own educational curriculum. So unlike other countries, where you would have one common education curriculum which teaches the same facts and history to all of the country's children, here the political parties of the three main groups have managed to maintain control of the educational system for their youth. When you have three different educational curriculums teaching three different approaches to history, it makes it very difficult for the country to unite around one common national vision. There's just not even agreement on what happened during the war. If we can support those types of grass-root reconciliation efforts and get some momentum from them, then we think it'll create enough pressure on politicians to begin to realize that they can't continue to keep this type of division going indefinitely.